This is not my list of best all-time crime books, or a list of my favorites, but instead this is a list of those books that, for whatever reason, ended up scaring the bejeebies out of me. 1. I THE JURY by Mickey Spillane (1947) – I picked this up in a used bookstore in Jerusalem, decades ago. 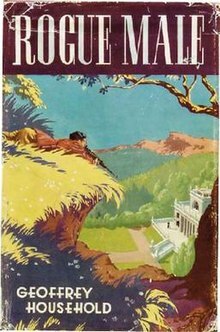 It was a raw looking pulp paperback with a dame on the cover. (She is always a dame in a Mike Hammer novel.) I stayed up with it late into the night and as the murder count rose I grew ever more terrified. Bodies were falling every which way and somehow I was certain the killer was walking the streets outside my apartment and I was next. I prefer Hammett and Chandler to Spillane, but I can tell you I’ve never been so scared reading a book. 2. WHERE ARE THE CHILDREN by Mary Higgins Clark (1975) – Something about this book chilled my blood. I remember reading it through the night in my boyhood home and feeling ever more frightened. Yeah, where are the children? Where? I think experiencing the book in the same bed I had slept in as a child was what did it to me. I kept feeling that something terrible had happened and that maybe it had happened to me. 3. 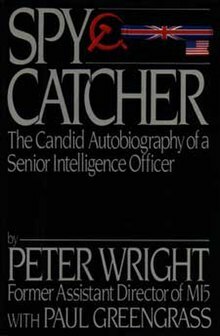 SPYCATCHER by Peter Wright (1987) – I’m a huge LeCarre fan and TINKER TAILOR is one of my favorite books, but that didn’t ignite my nerves like this gem – the autobiography of the man who was actually assigned to find the mole in MI5. Yes, there’s much about Kim Philby in the book (his NYTimes obituary is pressed within the pages of my copy) but it’s not so much the rightful suspicions about Philby that got to me, it was the way everyone was a suspect and no one could be trusted. The head of the CIA, the head of MI5, the author’s wife. Somehow Wright’s overwrought suspicions latched onto my nervous system and I was paranoid for weeks after reading the thing. 4. CRIME AND PUNISHMENT by Fyodor Dostoyevsky (1866) – The crime itself in this novel, the double murder of an old lady and her half sister, is truly horrific, one of the most wrenching murder scenes I’ve ever read. And there is the original prostitute with the heart of gold, so the book’s got that going for it. But the parts that stunned me were the interrogations of the killer, Raskolnikov, by the police inspector Porfiry. Each interrogation started as an idle chat but turned so swiftly and suddenly into a brutal psychological examination that I was left as disorientated as Raskolnikov himself. The feeling of bewilderment stayed with me long after I finished the book. How did Porfiry do that? I still don’t know. William Lashner is the New York Times Bestselling creator of Victor Carl, who has been called by Booklist one of the mystery novel’s “most compelling, most morally ambiguous characters.” The Victor Carl novels, which have been translated into more than a dozen foreign languages and have been sold all across the globe, include BAGMEN, KILLER’S KISS, FALLS THE SHADOW, FATAL FLAW, and HOSTILE WITNESS. He is also the author of GUARANTEED HEROES, THE BARKEEP, which was an Edgar Award nominee and a Digital Book World Number One Bestseller, THE ACCOUNTING, and BLOOD AND BONE. Writing under the pseudonym of Tyler Knox, Lashner is also the author of KOCKROACH, described as “roaringly entertaining,” by Publisher’s Weekly, and “an energetic tour de force,” by USA Today. As Tyler Knox he has written a number of book reviews for the Washington Post Book World. Lashner was a criminal prosecutor with the Department of Justice in Washington D.C. before quitting the law to write fulltime. A graduate of the New York University School of Law, as well as the Iowa Writers’ Workshop, he lives with his wife and three children outside Philadelphia. William Lashner’s most recent legal thriller THE FOUR-NIGHT RUN, published by Thomas & Mercer, was released on May 24th. I read Jorn Lier Horst’s The Caveman recently; it was mega creepy and gruesome. It’s about a US serial killer who moves to Norway, taking over the lives of people who lead quiet existences, and don’t have friends or relatives. What he does with his victims is pretty hideous. But a great book, all the same – I’d recommend it.